The In Bed And Chair Recovery Foundation donated the Ultimate Workout And Recovery System to KJ, a kid with a BIG HEART, thanks to Greenbee Fundraising's help. 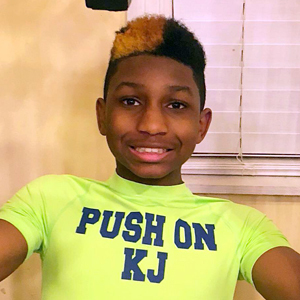 KJ is a popular wheelchair athlete who loves working out and playing basketball. He is 12 years old and from Mississippi and is very active and engaged in many Organizations. KJ is a little boy with a BIG heart! Two years ago, he suffered a Spinal Cord Injury. KJ has loved sports since he could walk & in spite of his disABILITY, he still plays on! Two years ago, KJ who just graduated from Kindergarten a week earlier was hit by a car. When his family reached KJ, he was unconscious and not breathing. His PaPa performed CPR for what seemed like an eternity! The more his Dad breathed in the more his chest rattled and he gurgled blood. After the ambulance arrived they transported KJ to Magee General Hospital and from there he was airlifted to Batson Children's Hospital in Jackson, MS.
KJ had a mild concussion, and his right lung collapsed. There was internal bleeding in his chest and brain. He had lacerations to his liver and spleen, and his spine was shattered. The doctors felt the liver would probably heal itself but their main concern was his spinal fracture. Despite his disABILITY he's a very active and athletic child! He's a honor roll student and he plays with the Mississippi WheelCats! KJ participates in wheelchair basketball camps, and this past year he received Defensive Player of the Year! His natural ability, cheerful attitude, and intelligence will drive him to succeed in life despite his unfortunate accident. KJ is an awesome kid! He loves the Lord, his family/friends, and he is determined to walk again one day but until then he will continue to PUSH ON! Click Here for more info about KJ. "Hey, JT received the big box today. We are going to let KJ open it up tomorrow as soon as he returns home from school. Again, Many Thanks!" "KJ really loves it! We have a big tournament in Atlanta this weekend. Gonna spread the word."